There is such beauty and variety in this world, and I love finding new varieties or colours of familiar flowers. I found a beautiful type of hellebore that is called "Night Coaster". It’s a deep jade shade which is so unusual for a flower. When Marcy illustrated the new Heart Abloom Digital Stamp Set I was excited about the big bloom also included in the set and couldn’t wait to use it focussing on some really unique colouring. I printed it quite large so it would be a real focal point, and gave it life with Copics. I trimmed the flower out, and actually trimmed one of the leaves off the flower adding it to another side to make this layout work better. 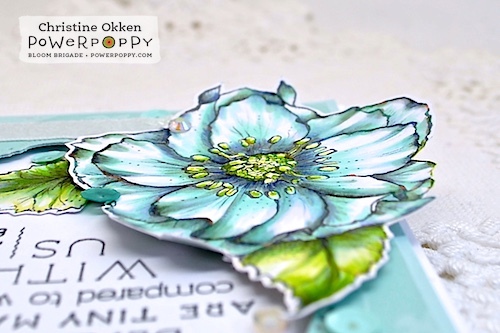 The sentiment inside the elegant window is from Power Poppy’s polymer set, Good Thinking: Renewal Stamp Set. Because that bloom is so big and offset from the card I added a sparkly ribbon to ground the image and help with overall balance. Isn’t that a beauty? I loved colouring this one! All those tones of blue green, jade and purple are really fun to combine. I added some sequins and faceted gems as accent. To help you see the sentiment a bit better and give it some dimension, I curled the edges of the flower petals forward which you can see a bit better in the above photo. Here were the Copics I used. You have a few more days left to enter our February Power & Spark Challenge of Love to Sparkle. I wouldn’t want you to miss out on the chance to earn a $50 Shopping Spree at the Power Poppy store! Christine, this is gorgeous! I love the colours of your flower. I like how you die cut the window to fit your sentiment. Fabulous card! 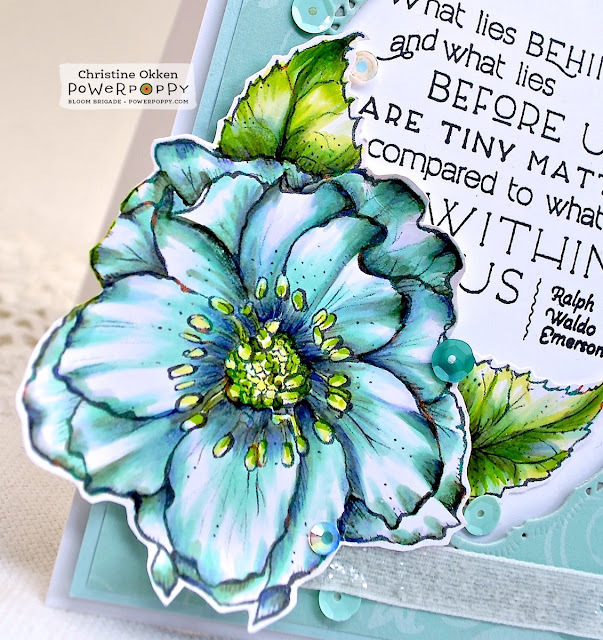 Christine, this s gorgeous, and I really love the colors you’ve used for your flower...wow! And what a great layout with the die cutout for the sentiment. This is one of my favorite flowers! Hugs, sweet friend! Ohhhh, aside from your gorgeous coloring and the wonderful quote, I love how you curled the petal edges. It's the little things that make the biggest difference sometimes. Gorgeous, Christine!